Will an Owl Go After a House Cat? For cat health, keep cats inside when owls hunt. While it might seem unlikely, owls can go after cats. Your average outdoor cat is not very likely to get airlifted by an owl, but if you're the type to be prepared for every type of injury or incident, be on the lookout for ambitious birds of prey. While it may not be common, this does happen. In 2012, a hoot owl reportedly snatched a pet cat in Minnesota. Since owls are nocturnal creatures, this type of attack would generally occur in the early evening or early morning. Since young owls are beginning to hunt on their own in May and June, these months may be particularly bad for owl attacks. Owls view the cat as a tasty treat. They also have been known to eat puppies, small dogs, rabbits, squirrels and rodents. If owls have adequate access to wildlife, they will be less likely to go after pets. A large house cat should be too heavy for an owl. Generally speaking, cats and kittens that weigh 5 pounds and under are at some risk of owl attack. But, while an owl may not be able to carry a larger animal, it can still attack one. For example, a 10-pound pet poodle was attacked by owls in 2005. Multiple types of owls have been known to attack domestic cats. These include the hoot owl and the great horned owl. Identify the hoot owl by its call, which sounds like "Who cooks for you!" Identify a female great horned owl by her "whoo, whoo-hoo, whoo-oo, whoo-oo" call and a male great horned owl by his "whoo, whoo-hoo, whooo, whooo" call. 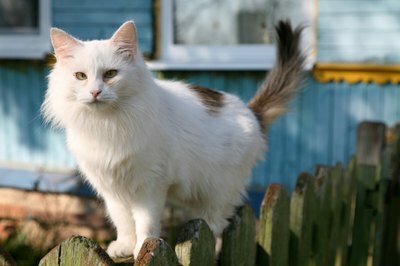 Outdoor cats that stick around the yard should be safer than those that tend to roam and may be caught unawares. To protect cat health, avoid letting her roam during the hours that owls hunt or keep her inside altogether. Outside kitties face more dangers than just owls.